Scientists have long known that Jupiter is a stormy place. But since NASA’s recently extended Juno probe reached the solar system’s largest planet last July, they’ve found it to be a far more tempestuous place than they realized. The first-ever detailed look at Jupiter’s polar regions—captured during Juno’s first orbit last August—reveals chaotic swirls of storms, some measuring up to 1400 kilometers across, researchers reported in Science. The study, reports AAAS's Science, also shows that Jupiter’s equator is home to a broad plume of ammonia rising from deep layers of the atmosphere, a “striking and unexpected” feature found by beaming microwaves into the jovian atmosphere, the researchers say. Other data indicate that Jupiter’s magnetic field is nearly 50% stronger than previously suspected in some places, hinting that the movement of electrically charged particles deep in the planet’s atmosphere may rise closer to the cloudtops than previously presumed. Other electrically charged particles power Jupiter’s polar auroras. But unlike those on Earth—which are fueled by particles streaming in from space—Jupiter’s polar auroras are powered by streams of electrons rising from deep within the planet’s atmosphere, reports another study published in Science. One of Juno’s next targets: Jupiter’s iconic Great Red Spot, scheduled to get its close flyby in July. NASA’s Juno probe has been studying Jupiter for almost two years, but it’s taking Juno longer than NASA expected to map the gas giant, and operations were scheduled to cease this summer. NASA has just secured an additional $1 billion in funding to extend the mission for at least three more years. Juno arrived in the Jovian system back in July 2016 after launching from Earth in 2011. NASA started Juno off in a 53-day highly eccentric orbit of Jupiter. Since the planet has intense radiation belts that can fry delicate internal components, mission managers wanted the probe to spend as little time as possible in close proximity to it. Originally, NASA intended to fire up Juno’s engines and shorten the orbit to just 14 days. But, as NASA prepared to tighten Juno’s orbit, the team detected potential issues with the probe’s engines. 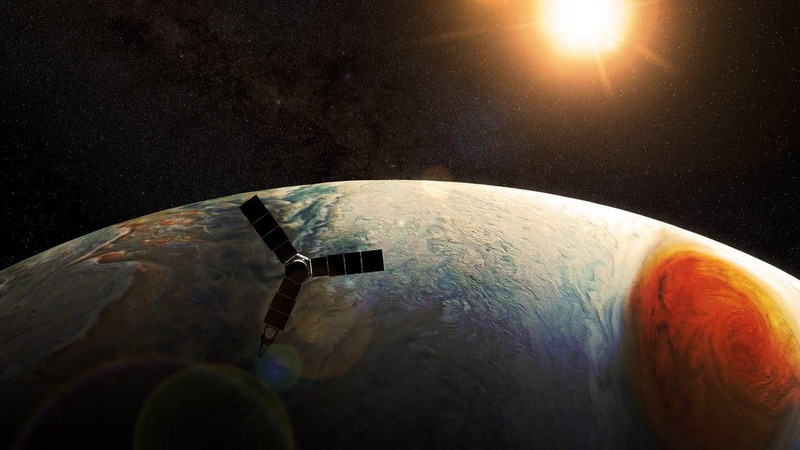 Rather than risk damage that could cripple the probe, NASA opted to leave Juno in its higher orbit ensuring Juno would remain operational, but it also introduced a considerable delay in the primary science mission. Juno is in a polar orbit, so each time it sweeps around Jupiter, it sees a different part of the planet up close. The longer orbit means a roughly four-fold increase in the amount of time it will take to map the gas giant. The extension means Juno can continue operating through September 2021 to complete all the mission’s critical science objectives. So, we can expect a lot more amazing science to come out of Juno over the next few years. When the time does come to retire Juno, NASA will dive to its death into Jupiter to ensure it doesn’t one day crash on one of Jupiter’s moons, some of which a prime candidates for alien life.